Based on Helen Fitzgerald’s novel of the same name, Jacquelin Perske’s four-part adaptation of The Cry will leave you reeling. Its twisting, nonlinear narrative unravels a gripping story that begins as a mysterious tragedy, becomes a study of extreme guilt and grief, transforms into a thriller about emotional abuse and ends as one woman’s reclamation of her autonomy. 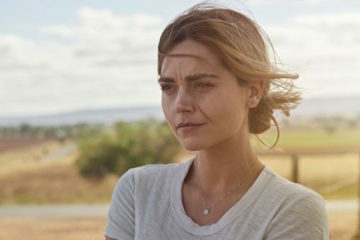 The series, broadcast on BBC 1 and now available on iPlayer, follows couple Joanna (Jenna Coleman) and Alistair (Ewen Leslie) as they travel with their young baby, Noah, to Alistair’s native Australia in hope of gaining custody of his teenage daughter, Chloe, who lives with her mother, Alex (Asher Keddie). Only hours after they arrive, every parent’s worst nightmare comes true when baby Noah goes missing from their car, presumably snatched as Joanna, realising she forgot something, joins Alistair inside a supermarket for just a few minutes. This pivotal moment occurs at the end of the first episode from which point the series begins to follow a familiar ‘whodunnit’ narrative. Alex seems to have a strong motive, with Alistair having cheated on her with Joanna, and now fearful of losing their custody battle. Having been caught snooping around the couple’s holiday apartment and just happening to be in the vicinity on the night Noah disappeared, she makes for a likely suspect. But the unfolding narrative is interlaced with scenes of the present day Joanna talking to a therapist whilst seemingly on trial for charges unclear to us – could it be for Noah’s disappearance? As Alistair begins to reveal his controlling side, our suspicions are raised about each of the central three characters, only for The Cry to suddenly flip the whodunnit on its head, amplifying this powerful portrayal of grief as it shows the couple grappling with the situation they’ve found themselves in while also exploring manipulative relationships and the toxic masculinity of controlling men. Spin doctor by profession, Alistair becomes one in his personal life, paying journalists to write articles questioning the police search and arranging television interviews where he asks Joanna if she might cry. He becomes threatening, to both Joanna and Alex, and even his mother recognises his manipulative side. This sadly feels like a kind of relationship that is still all too common: the controlling man who guilt trips, even gaslights their partner, making them believe they’re the problem. What initially appeared as a somewhat predictable thriller becomes a complicated relationship study and as the controlling side of Alistair’s nature is unleashed, Joanna finally becomes aware of his constant manipulation. As we witness Joanna undergoing this realisation, The Cry compellingly shows us why she doesn’t walk away from him immediately. People in controlling and emotionally abusive relationships are often harshly judged for not leaving or ending their relationship, without much thought given to the manipulation that can sometimes make it extremely difficult to even recognise the emotional abuse as such. Paralysed with grief and barely coping and without a support network – with no immediate family and her best friend on the other side of the world —the simplest thing Joanna can do is to keep going, heartbroken over the loss of their child. As she starts to stand up to Alistair, he accuses Joanna of losing control, but this is just the start of her attempt to regain it. We know she achieves it, for in the scenes that flash forward to Joanna in the present she seems like a different person, assured and confident, despite being on trial. But how exactly she gets there – and what she’s on trial for – is a question left unanswered until the final two episodes. Eventually returning to Scotland, Joanna starts back at work but is hardly able to face her best friend, and watches Alistair with disdain as he continues to work with his publicist. Her grief and guilt holds her captive in their relationship, unenthusiastically accepting Alistair’s marriage proposal and apparently going along with his plans for a new baby, yet secretly taking birth control pills. Everything comes to a head after Joanna reads the letters sent to them via Alistair’s publicist, finding one that changes everything. The letter, from a woman who sat behind her on their flight to Melbourne, contains the seed from which her liberation grows. Joanna asks Alistair to join her on a drive, getting away from his visiting mother and Chloe, and as they admire the views across the Scottish countryside, Alistair keeps talking about having another child. “I don’t want another baby,” Joanna finally admits. “You’ve got to forgive yourself,” he replies. She stares back at him icily, on the cusp of confirming she may be able to do just that after all. The series finale is as shocking and bold as the punchy twists that await viewers at the end of each episode, while also providing a satisfying resolution that sees Joanna regaining her autonomy, enabling her to move on and recover. The series also boasts excellent characterisation: both Joanna and Alistair are far from being the one-dimensional victim and antagonist. Joanna has a spiky, cold side from the start, and despite all of Alistair’s self-serving ways, we feel his devastation at losing Noah. Another merit of the series is its realistic portrayal of parenting a young baby. In the first episode we see Joanna caring for Noah largely by herself, exhausted, often struggling, wondering how some parents seem to be able to leave the house with their babies so effortlessly. The judgement mothers face follows her everywhere, especially as we watch her endure the gruelling 24 hour flight to Australia, during which Noah won’t stop crying, causing Joanna to snap at one of the complaining passengers. With Alistair asleep during most of the flight, and doing little to help when he gets home from work, the need for more evenly shared parenting between couples is also highlighted. Despite some problems with pace, which surprisingly lags at times despite the thrilling twists, and a somewhat overdone quality to the nonlinear narrative, The Cry is both a gripping and thought-provoking watch that transforms in unexpected and fascinating ways. Images taken from BBC websites, used for promotional purposes. 1. A white woman and a white man (Jenna Coleman as Joanna and Ewen Leslie as Alistair) with disturbed expressions on their faces are being interviewed by the news crews, there are microphones pointed at them as they are facing the camera. They are standing outside of a house, with the man behind the woman holding his hands on her arms. There are some blurred people behind them in the background. 2. Close-up of a white woman (Jenna Coleman as Joanna) standing in the field, with wind playing with her dark hair so wisps are on her face. 3. A white woman and a white man on the plane, he is sleeping with an eye mask on while she’s holding a baby on her lap, her eyes open. They are Jenna Coleman as Joanna and Ewen Leslie as Alistair.